The former “Kurhaus Fidaz” is set in a landscape that was formed about 15,000 years ago by the enormous Flims landslide. The Rhine glacier, which was about 200m thick,was starting to recede. As a result, the rock masses between Piz Grisch and Flimserstein lost their foothold, and tumbled over a distance of 16km into the Upper Rhine valley, covering it with a layer of rock about 500m deep. Untilnow, the Rhine has washed out a deep gully, creating the unique “Ruin aulta”, the Rheinschlucht gorge. The Flims-Laax-Falera region developed on the terrace overlooking this gorge. The photo shows the village of Flims in around 1900. The oldest documents have been dated to the year 765. The neighbouring settlement of Fidaz grew on the sunny slope above the village of Flims. 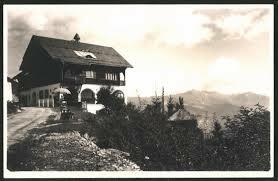 It was inhabited by the Germanic Walser people in the late Middle Ages. During the Napoleonic wars, towards the end of the 18th century, many armies travelled through the valley, bringing poverty, misery and disease to the population for a period that lasted well into the 19th century. The “Waldhaus Air, Whey and Lake Resort Institution” was founded in 1875, with the “Kurhaus”, now known as Parkhotel Waldhaus opening in 1877. KURORT Flims was thus established as a spa location. Guests flocked here because the climate soon became famous for being particularly wholesome and therapeutic. Development continued at a rapid pace: new hotels sprang up, electric light was generated by the area’s first power station in 1890, telephones arrived in 1901, the Flims spa and tourism association was set up in 1904 and a casino opened in 1905. The photo on the left was taken in 1912. The first detachable chairlift was constructed after the Second World War. Due to the lack of cement and iron, the masts were made from larch trees. This lift stretched from Flims to Foppa and laid the foundation for the construction of later lifts. The Foppa - Naraus section was opened on 9th February 1947. 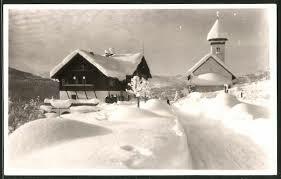 Flims was now well equipped for tourism throughout the year. Tourist numbers became higher in winter than in summer for the first time in 1970. S' ist halt Oktober, nicht mehr Mai! Und keiner kommt drum herum. Wo' s fast zu heiss, doch lieblich war. Ob kurz, ob lang sie dagewesen,…. Auch Sie sind mit dabei, persé! Ein kleiner Gruss… und nochmals Dank.